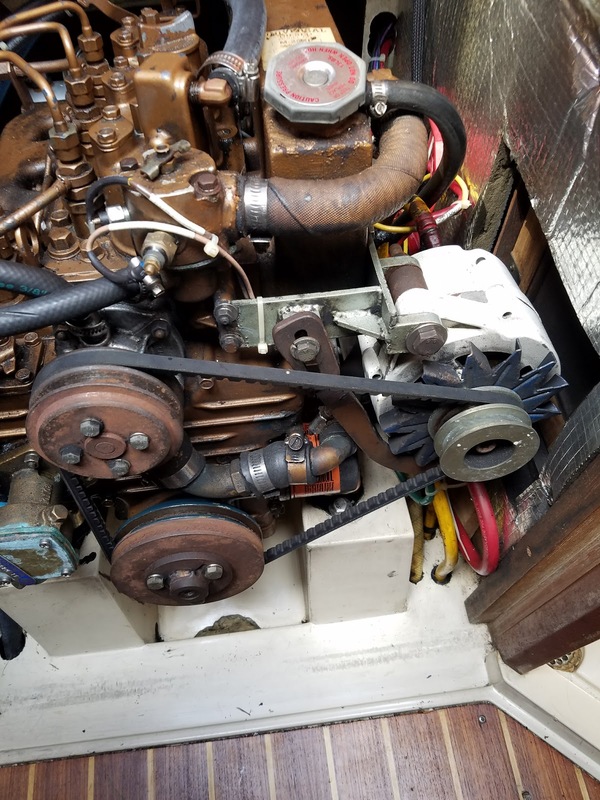 Introduction: Our alternator drive belt sprays belt dust over the front cover of our boat's engine compartment. It's not a horrid amount, but enough to be a concern. Asking other owners of Catalina 34's the problem appears to be the Alignment of the Alternator compared to that of the engine main shaft pulley. So I'm digging in to see what's amiss. 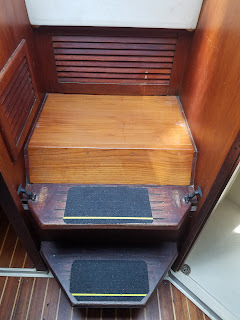 here's the companionway stps that cover the engine. They are made up of three parts. Top Steps, Cover, and lower steps. 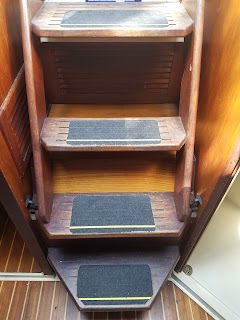 They are held in place by rubber bungees between the lower steps and the upper steps. All 3 step sections removed. Here you can see the Engine and three pulleys. On the left are the top Engine Coolant Pump Pulley. All three are driven by the belt that encompasses all three pulleys. Note the the 3 pulleys are actually doubles. but only the inner, nearest to the engine are used. 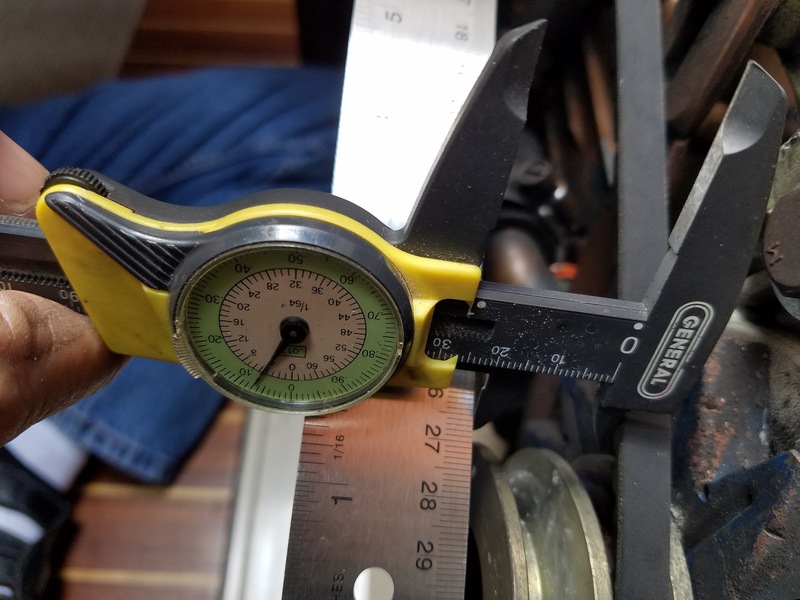 It's the belt alignment that is important. It ideally will travel parallel to the normal of each pulley shaft. 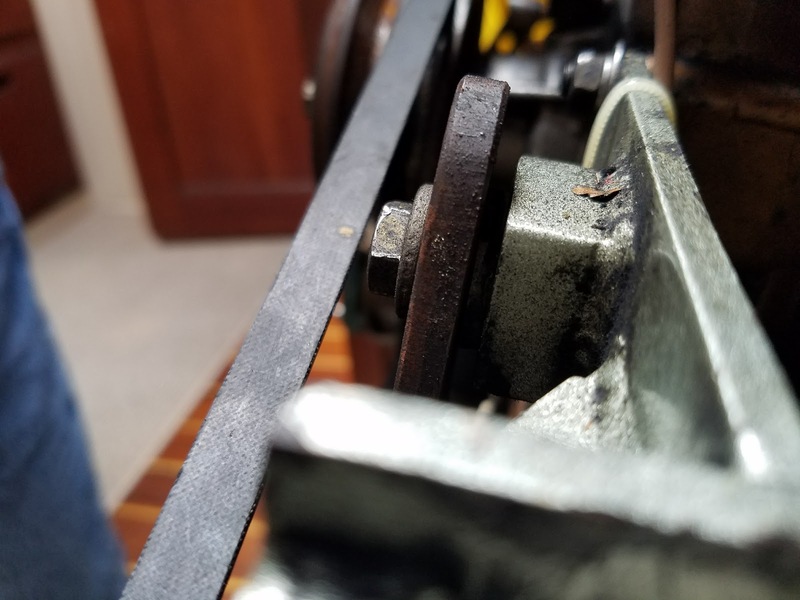 Here's the Main Crankshaft Pulley. The inner ring is the one used by the belt. I have no idea why, whoever installed this, there are double pulleys on all three. 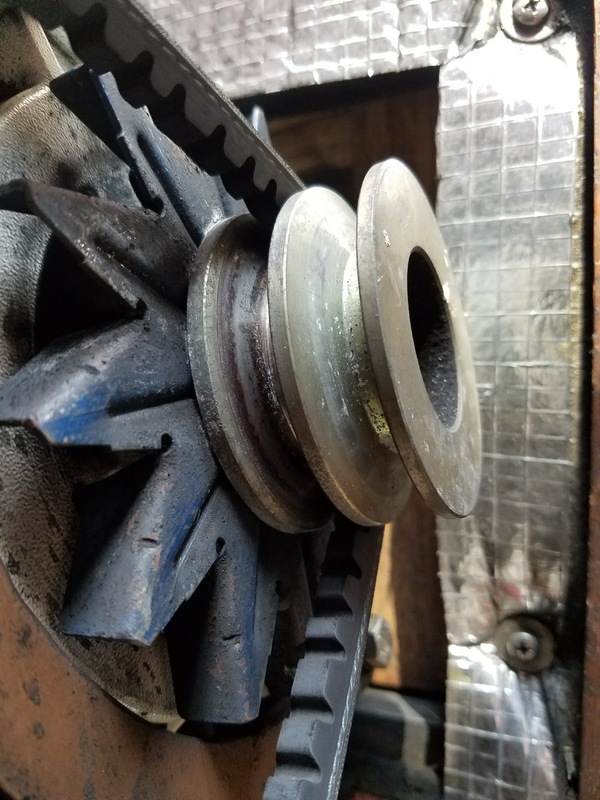 Here's the Engine Coolant Shaft Pulley. Here's a view of the Alternator Mounting Bracket (note the spacer between the bracket ears aft of the alternator mount ear. Obviously custom made. 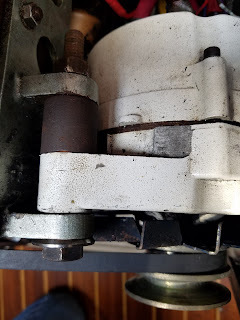 Here's a close up of the Alternator Support arm attached to the Mounting bracket. Here's where the Alternator Mounting bracket is connected to the front of the Engine timing plate cover. 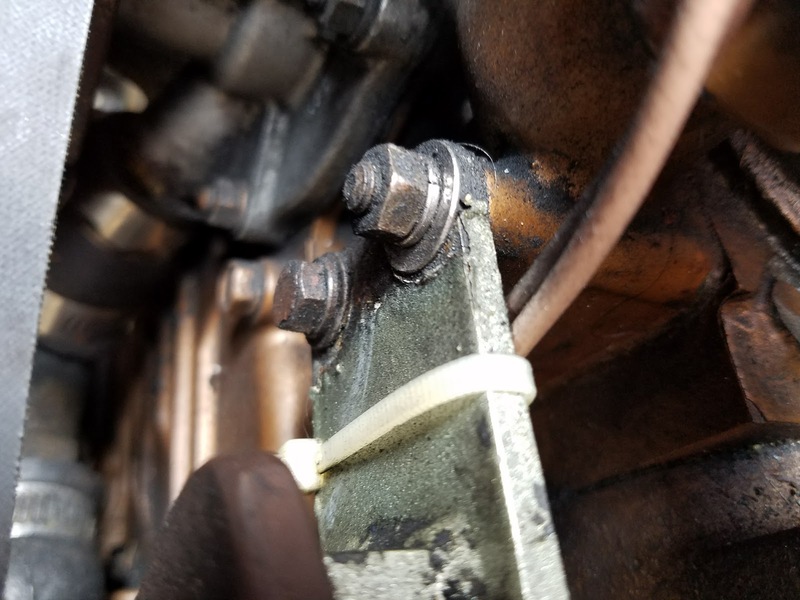 The tiewrap is to secure the engine temperature sensor wires. 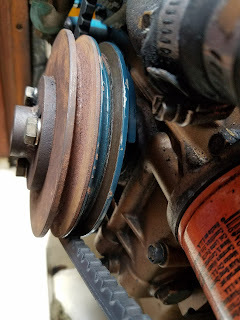 This pic shows the lower part of the Alternator support arm connected to the lower ear of the Alternator. 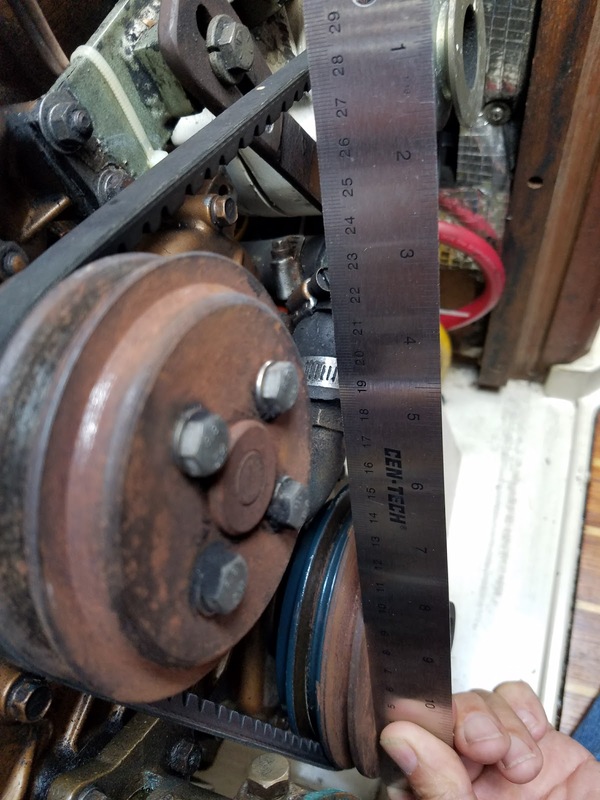 This is just to demonstrate where I'm using the Engine Main Crankshaft Pulley face as the reference to measure the belt alignment. 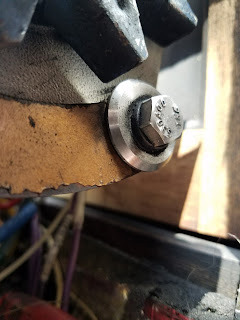 The Steel rule is being held on it's edge against the face of the crankshaft pulley. 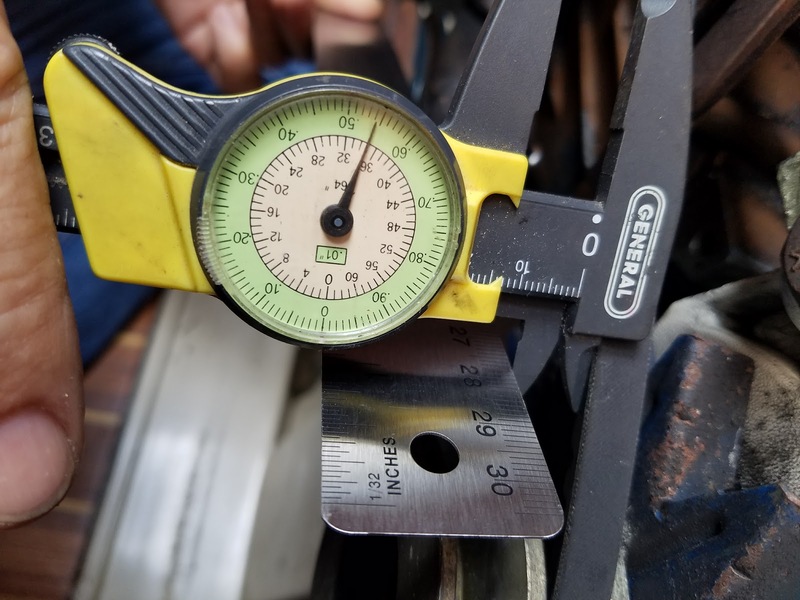 First Measurement. 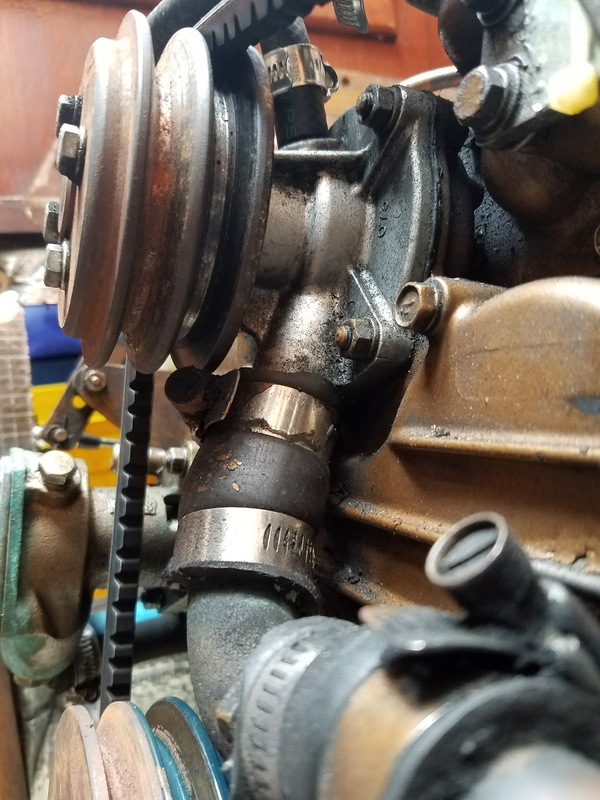 .585" between the edge of the rule on the face of the Crankshaft pulley and the edge of the belt nearest to the Coolant Pulley. This evaluates to a .045" difference. Indicating that the alternator needs to be moved aft by ~.045"
3rd Measurement. 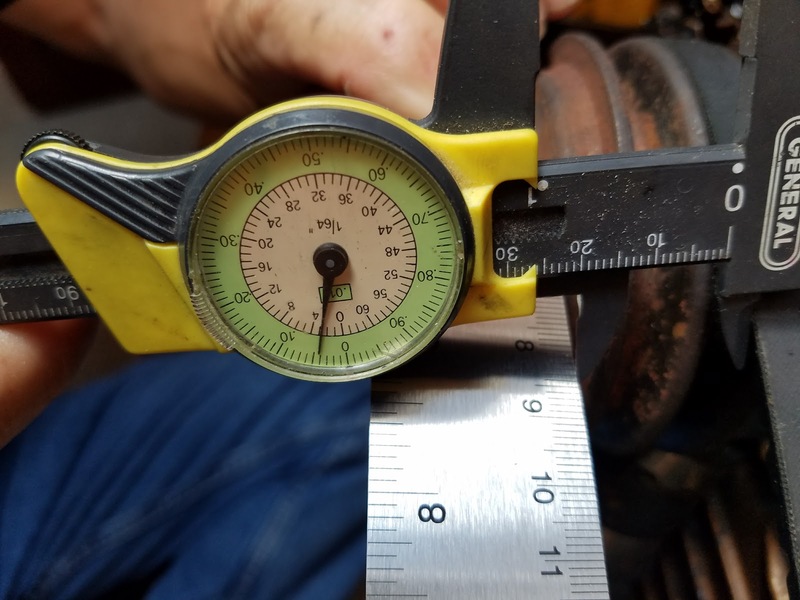 1.04" from the edge of the rule on the face of the coolant pump pulley to the belt. 4th Measurement. 1.07" from the rule to the belt nearest to the alternator. Again, this indicates that the alternator needs to move aft, by .03"
So far, I conclude that the alternator needs to more aft by about 0.04"
I would like to figure out if the alternator shaft is parallel to the main crankshaft. But let's take care of the first alignment issue. Next, how to move the alternator .04" aft. The Alternator mounting bracket has slots in it that allow for adjustment fore and aft of about .25" and I think it is currently almost fully aft, but won't know till I loosen the bolts holding the mounting in place to the exhaust manifold & coolant tank. 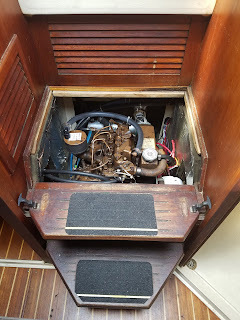 Should be pretty easy, just loosen the 4 bolts and try to move the Alternator aft. It looks like that will be Tuesday's project. 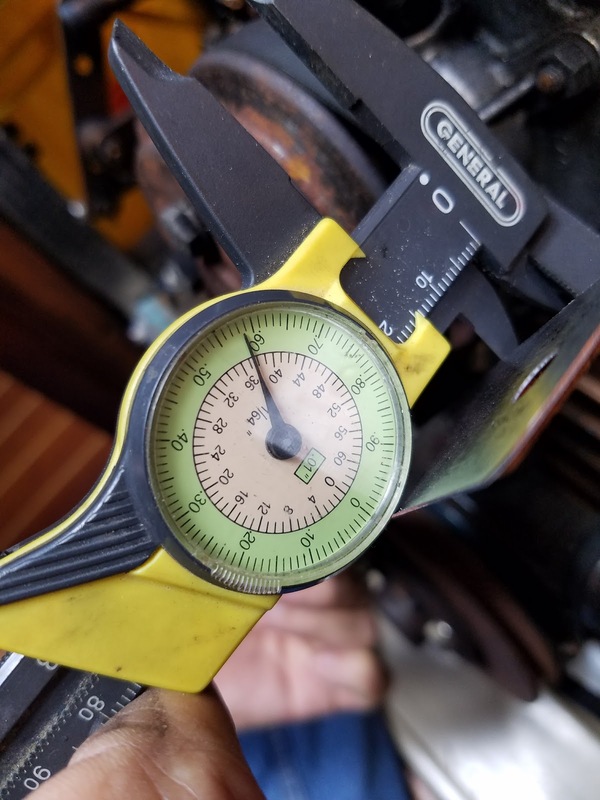 I measured everything again, (measure twice - cut once) Installed a new Alternator in May 2017, alignment was just sweet!